You Can Sleep Soundly Knowing Your Bunk Beds Are Safe. When eager kids first arrive at camp, they are a picture of pure excitement. It’s a beautiful thing to see. However, kids must be able to learn, play and sleep in an environment that is designed for safety and able to withstand all that unbound energy week after week. One measure of fundamental safety includes a close look at your campsite’s bunk beds. A mainstay at many of the 14,000 sites across the country, bunk beds offer the fantastic benefit of maximizing space. But risks include potential falls from the upper bunk as well as situations in which a child might become trapped within the bed structure or between the bed and the wall. The Consumer Product Safety Commission (CPSC) and the American Camp Association (ACA) are in alignment with the standards they apply to bunk beds to protect campers from possible risks. There are six CPSC requirements for bunk bed guardrails and four for the end pieces, based on federal law. Each point is quite specific about the bed’s construction. For example, if a guardrail does not attach to an end of the bunk bed, the gap between the guardrail and the end of the bed cannot be greater than 0.22 inches. Additionally, bunks that children sleep in may not have sharp points or edges and are subject to extensive surface-coating requirements. The federal laws were created several years ago because too few furniture manufacturers adopted voluntary rules for safety. At Furniture Concepts, our line of bunk beds fully meet today’s standards and can help your camp maintain its safety and compliance. 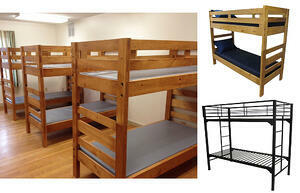 Properly designed bunk beds for camp use represent a specialty in furniture solutions. Our comprehensive line of wood and metal bunk beds complies with CPSC and ACA standards while also offering serious durability in the heavy-use environment of overnight camps. Consider our extremely flexible Chocolate S Design Twin Over Full bunk bed that features solid wood construction with a contemporary curved design. At 81 inches in width, the bed maximizes space and allows for family accommodation of Mom and Dad, along with their Junior Camper safely tucked into the top bunk. At your youth camp, the sleeping quarters might call for different sized mattresses. Easy enough! Whether the mattress is 30, 36 or 39 inches wide, or 75 or 80 inches long, our frames fit perfectly. They include guardrails and built-in ladders that won’t budge, even with heavy use by excited campers. Demountable bunk beds—which can be converted into two twin beds—are an extra-flexible solution among our metal-frame options. Storage is also a snap with the addition of our wood or metal underbed storage chests and divided cabinets that allow campers to stash away their stuff in a convenient space. You can make the most of every inch with the combined bed/storage designs. With our wide variety of frames, materials and finishes, your camp can offer bedrooms that are safe, comfortable and fun. And that’s something to write home about. CPSC’s requirements for children's bunk beds can be found here: 16 CFR Part 1513.